Simulations by Rice University scientists show that placing cones between graphene and carbon nanotubes could enhance heat dissipation from nano-electronics. Image: Alex Kutana/Rice University. A few nanoscale adjustments may be all that is required to make graphene-nanotube junctions excel at transferring heat, according to scientists at Rice University. The Rice lab of theoretical physicist Boris Yakobson found that putting a cone-like ‘chimney’ between the graphene and nanotube all but eliminates a barrier that blocks heat from escaping. The researchers report their findings in a paper in the Journal of Physical Chemistry C.
Heat is transferred through phonons, quasiparticle waves that also transmit sound. With their nano-chimneys, Yakobson and his team now offer a strategy for channeling damaging heat away from next-generation nano-electronics. Both graphene and carbon nanotubes consist of six-atom rings with a chicken-wire appearance, and both excel at the rapid transfer of electricity and phonons. But when a graphene sheet is rolled up to form a carbon nanotube, the carbon atoms facilitate the rolling up by forming heptagonal (seven-member) rings instead. Scientists have determined that forests of nanotubes grown from graphene are excellent for storing hydrogen for energy applications, but in electronics the heptagons scatter phonons and prevent heat from escaping through the pillars. The Rice researchers have now discovered through computer simulations that removing atoms here and there from the two-dimensional graphene base forces a cone to form between the graphene and the nanotube. The geometric properties (or topology) of the graphene-to-cone and cone-to-nanotube transitions require the same total number of heptagons, but they are more sparsely spaced and leave a clear path of hexagons in the cone through which heat can escape, producing a nano-chimney. "Our interest in advancing new applications for low-dimensional carbon – fullerenes, nanotubes and graphene – is broad," Yakobson said. "One way is to use them as building blocks to fill three-dimensional spaces with different designs, creating anisotropic, non-uniform scaffolds with properties that none of the current bulk materials have. In this case, we studied a combination of nanotubes and graphene, connected by cones, motivated by seeing such shapes obtained in our colleagues' experimental labs." 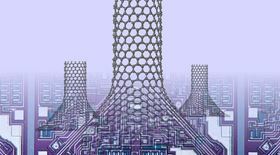 The researchers tested phonon conduction through simulations of free-standing nanotubes, pillared graphene and nano-chimneys with a cone radius of either 20 or 40 angstroms. The pillared graphene was 20% less conductive than plain nanotubes. In contrast, the 20-angstrom nano-chimneys were just as conductive as plain nanotubes, while the 40-angstrom nano-chimneys were 20% more conductive than the nanotubes. "The tunability of such structures is virtually limitless, stemming from the vast combinatorial possibilities of arranging the elementary modules," explained Alex Kutana, a Rice research scientist and co-author of the study. "The actual challenge is to find the most useful structures given a vast number of possibilities and then make them in the lab reliably. "In the present case, the fine-tuning parameters could be cone shapes and radii, nanotube spacing, lengths and diameters. Interestingly, the nano-chimneys also act like thermal diodes, with heat flowing faster in one direction than the other." Rice graduate student Ziang Zhang is lead author of the paper. Ajit Roy, a principal materials research engineer at the Air Force Research Laboratory in Dayton, Ohio, is a co-author. Yakobson is a professor of materials science and nanoengineering and a professor of chemistry. The Air Force Office of Scientific Research and its Multidisciplinary University Research Initiative supported the research. Calculations were performed on Rice's National Science Foundation-supported DAVinCI supercomputer administered by the Center for Research Computing, procured in partnership with the Ken Kennedy Institute for Information Technology.